Now that I’ve over-glutenized the past few days with the No-Knead Multigrain Bread, it’s time for a little fantastic gluten-free action. Last month at our weekly potluck, we celebrated a few birthdays with a Vegan Balls & Gluten-Free Phallic night. My friend Mark showed up with some awesome gluten-free vegan lentil falafel things that I fell in love with. Spicy, lentil, quinoa nuggets wrapped in lettuce with a splash of lemon, they made my night and now they can make yours too. Feel free to fry them in a tiny bit of oil or just leave them unfried–either way they’re delicious. Place the cooked lentils and cooked quinoa in a large mixing bowl. Meanwhile, saute the onion and carrot dice in the olive oil for 5-7 minutes until translucent. Add the diced jalapeno and garlic and saute 1 minute more. Add the salt, cumin, aleppo pepper, and black pepper and saute 1 minute more. Deglaze the pan with a splash of water and transfer the onion mixture to the bowl with the lentils and quinoa. Add the chopped parsley. Stir the mixture with a spoon until well combined. When it’s cool enough to handle, mix with your hands for a few minutes more, then form into balls. At this point you can fry the falafel or leave it as is. Serve with fresh lettuce to wrap the falafel in and spritz with lemon before eating. This looks like a wonderful adaptation. Although I’m not familiar with quinoa, this falafel sounds great for me. I’ve seen it in many food blogs, but still couldn’t find it at supermarkets here. As I love changes in my usual dishes, I will make my lentil balls with your additions and changes. And thank you for giving a link to my post. They look so yummy! Could you bake these instead of frying? I love lentil anything so I’m excited to try this! Quinoa AND lentils in a falafel? OMG, these sound too good to be true. I am going to make these very soon. Did you use red quinoa? The patties look darker than I would imagine. Oh, yum! Do you think they’d hold up in the oven? yummers! 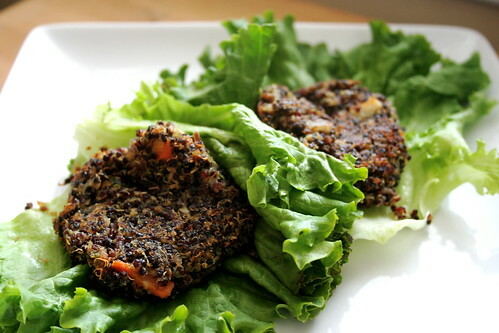 i love falafel and this is a great way to reimagine it with delicious ingredients. thanks for the recipe! Delicious! I love new takes on old favorites 🙂 Will have to keep this in mind next time I whip up some lentils! heck yeah! I make little lentil and grain patty-croquette-burger things like this all the time, and they are always great. I usually bake them and they hold up fine! it’s also worthwhile to make as many as possible, then throw them in the freezer for future lazy fooding. Ooooh these look fantastic! what a great idea, quinoa and lentils are 2 of my favorite things. Can’t wait to try these. Thanks! Those look awesome. I am forever looking for new protein packed transportable goodies! i don’t have red lentils right now, but i do have red quinoa… maybe i’ll try to switch those colours up. looks yum! These look so good and spicy! Great recipe. I just had a huge bowl of quinoa, I wish I had leftovers for these! these sound and look awesome, Jes! i’ve got everything on hand to make these, too! while we ran out of green lentils, i’ve got a HUGE mason jar full of the red ones. ooooh, now i’ve gotta make these soon! thanks! I don’t know what to say other than- This is so cool! Seriously, I’ve had falafel made of all sorts of beans and seeds before, but still I never considered grains. And quinoa is a favorite, so I’m definitely trying this out. What a creative new interpretation! Good idea to add quinoa to falafels. It should give a real change. I loved these and I really liked eating them wrapped in a lettuce leaf. I had not thought of that before–what a great flavor that comes through better than if I were eating it with bread. I just used 1/2 teaspoon of salt in this recipe–that’s all they needed. I wonder if it would work to steam collard leaves and stuff them with the “falafel” mixture. I think you are on to something!!! Can’t wait to try these puppies. Heads up – the falafels won’t hold their shape if you switch the ratio of lentils to quinoa.